The exhibition REACHING PORT grew out of working at Station Studio in Port Douglas during the months of September and October. Boats and fish have long been metaphors in my work and I think this little exhibition will be the finale of an exploration of my family's migration to Australia. At the same time I have been reading a book edited by Carina Houng called The Boat People, which contained gut wrenching accounts of people who fled Vietnam in the 70's. Also at this time the news was full of accounts of the current wave of boat people. The exhibition is not about them, but I think somehow they have crept in. My studio is Holloways Beach. I recently found out that a boatload of refugees were washed up at Holloways Beach in March of 1999. There seems to a mystery as where they came from, and where they went, but there is a story that local artist Ken Brinsmead used to sit at the cafe on the beach and paint or sketch and write in his journal every morning. He witnessed the event and made some paintings about them. Perhaps it is they who have crept into my paintings! Fishing is an activity that spans time and culture, as does the use of the fish as a symbol in art. As well as being a literal depiction of a common activity at Port Douglas the fish is my metaphor for spirituality, creativity and the feminine. The fish, with their layers of meaning, may, or may not be caught. 'Reaching Port' opens at the Art Room at Vivo Restaurant in Palm Cove at 5.30 – 7.30 on Friday 16th December. The exhibition will continue until March 2012. Vivo is Located at 49 Williams esplanade in Palm Cove. The restaurant opens daily from 7 AM. Reaching Port, imprint, dream and memory~influence of arrival by boat..sea migration~ as when I lived in New Denver, British Columbia, Canada. My small house had been built in the early 40's as part of a Internment Camp. Canadian citizens of Japanese descent who had settled in British Columbia, were forced off their land,gardens and orchards~ fishers gave up their fleets and families were sent away from home, bearing little of their family possessions, few photographs, kimono perhaps.. to live in various settlements in the interior of British Columbia. The house where I lived in 2005, kept memories of sorrow, hearbreak and loss. Perhaps my dreaming or 'remembering' brought a painting posted here 'Acanthus Dress'depicting an Asian woman, standing by the sea, reaching out to two small birds who are in flight above her. Beside them, a rootless fruit tree. I have only my impressions from living in an old house that was perhaps an inland shelter during war, where a woman wept and longed for her home on the coast. Wept for a dead child, a lost grandmother, too old to suffer a long journey..
Film maker, Ann Wheeler created a story based in these histories.. 'The War Between Us'. 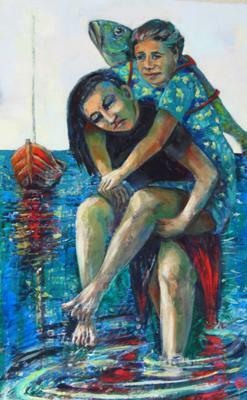 Thank you for painting 'Reaching Port' for this image reflects a human gesture of love in a time of war. A strength of 'carry', of rescue and hope.